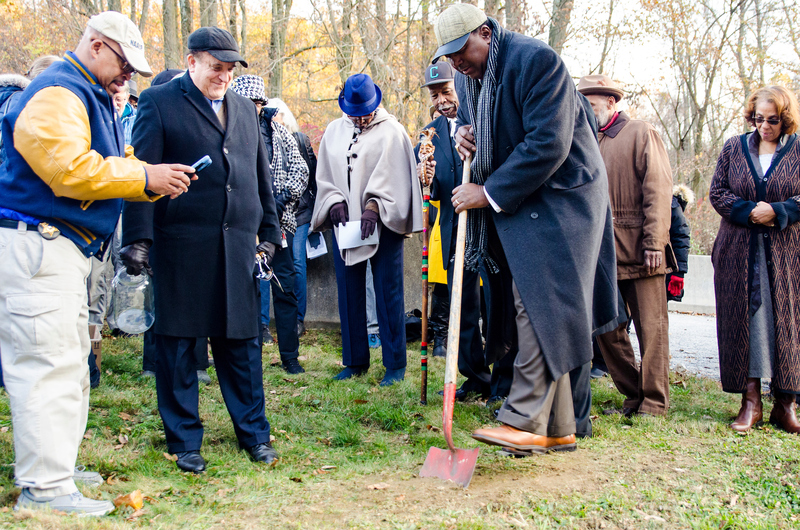 Image caption: a community member breaks ground during a South Coatesville Community Remembrance Project. Lynching, usually remembered as a form of sanctioned racial terror in the South following the Civil War, was also carried out in the North. The Equal Justice Initiative is constructing a Legacy Museum “that explores the legacy of slavery, racial terrorism, segregation, and contemporary issues of mass incarceration, excessive punishment, and police violence.” The museum opens this year in Montgomery, Alabama. Zachariah Walker was a steel worker lynched on August 13, 1911 in Coatesville, Pennsylvania. On November 12, 2017, a group of about 50 people gathered at the site of his lynching to remember and to collect soil as part of Equal Justice Initiative’s Community Remembrance Project. One jar of soil will remain with the local NAACP chapter. The other jar will become part of an exhibit at the Legacy Museum. Two jars hold soil from where Zachariah Walker was lynched in South Coatesville. Zachariah Walker’s lynching is described in the book, “No Crooked Death,” whose title is taken from his final recorded words before he was thrown on a fire and burned to death. Public outrage led to the NAACP’s anti-lynching project, and the state of Pennsylvania passed an anti-lynching law in 1923. The November event was organized by a coalition from Merion Friends Meeting, congregations in Coatesville including the Greater Deliverance Church, the local NAACP and the Equal Justice Initiative, based in Montgomery, Alabama. People take turns filling a glass jar with soil from the location where Zachariah Walker was lynched. Editor’s note: Coatesville, like the country, continues to struggle with its racism. Last October, hundreds of Coatesville Area High School students walked out in protest of incidents of anti-Black racism at the school and inaction by school administrators.